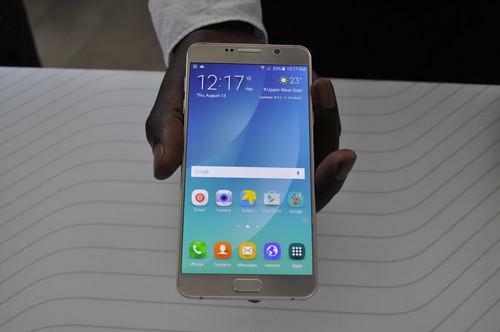 Samsung launched the Galaxy Note 5 at an event in New York Thursday. Apple's stranglehold on the market for the most expensive smartphones have left most vendors in the Android camp scrambling to make a living off of cheaper devices with lower margins. Recent data from market research company IDC illustrates how Android is losing ground in the $600+ segment. Just 8 percent of smartphones sold during the second quarter was in this category, down from 11 percent in the same period last year, according to Francisco Jeronimo, research director at IDC. At the same time, 82 percent of iPhones fell into this category, up from 60 percent last year, he said. Samsung is still convinced it can make a mark in this segment of the market. Adding to its portfolio of high-end smartphones, it launched the Galaxy Note 5 and Galaxy S6 edge+ at an event in New York on Thursday. Although the new products are very impressive, selling the tens of million units Samsung needs to make them a hit won't be easy. To an even larger extent than before, great products are no longer a guarantee for market success. "There is a general apathy towards new smartphones. Consumers just aren't as exited about the next big thing anymore. As far as they are concerned products have reached a level of maturity that's good enough," said Ben Wood, chief of research at CCS Insight. The cuts announced by HTC and Lenovo show just how ruthless the smartphone market has become. While HTC's struggles have been intensifying for a couple of years, Lenovo, helped by its acquisition of Motorola Mobility, seemed to be on the right track. But the second quarter painted a grim picture of its fortunes. While the overall market grew by just over 15 percent year-on-year, both Lenovo and Motorola shipped 32 percent fewer units, according to Strategy Analytics. The two have struggled with the transition from 3G to 4G smartphones in China and the U.S., it said. For example, Motorola never launched an LTE version of the second-generation Moto G in the U.S. The company finally launched a proper upgrade of the device last month along with new Moto X models. While the Moto G is the company's budget king, the new Moto X Pure (also known as the Style) is Motorola's take on what an Android-based high-end smartphone should cost and look like in 2015. The Moto X family is a perfect illustration of how the smartphone market has changed due to increasing competition. When Motorola launched the original model about two years ago, the 16GB version started at US$579.99, and last year the price for the second generation had dropped to $499.99. The Moto X Pure will go on sale next month, priced from $399.99. The new flagship isn't just cheaper, the smartphone also beats its predecessors in overall performance. So what's an Android smartphone vendor to do? Motorola is hoping the lower price of the new Moto X will help convince consumers to pick its flagship over Samsung's and Apple's much more expensive offerings. HTC, which is laying off 15 percent of its staff, is hoping to survive by expanding beyond smartphones. For its part, Lenovo said on Thursday it would cut 3,200 jobs and restructure its mobile business, with the aim of creating leaner and meaner company. To keep up, it will update its smartphones and add new models every six months, Lenovo said. If all this wasn't bad enough, manufacturers now have to take security vulnerabilities in Android seriously. Thanks to the operating system's enormous success, hackers looking to steal data or defraud users have increasingly targeted smartphones. Google will play a key role, but vendors have to get intimately involved to ensure their products are safe. Samsung and LG have said they are planning to push out patches monthly, and other vendors will have to follow in their footsteps sooner rather than later. This change will come with increased costs as well as the risk of alienating users if a patch fails or doesn't arrive soon enough. Highlighting how complicated this all is, Google had to release another patch to fix the Stagefright vulnerability after a security firm said the first one included a flaw. So if there is light at the end of the tunnel for the Android vendors, it's hard to find. There are exceptions: Huawei Technologies and Xiaomi, for example, can celebrate their second quarters, which were boosted by aggressively priced products that attract smartphone buyers in China. Huawei is also expanding rapidly across other parts of Asia, Europe and North America. In addition, smartphone sales are still growing, which is more than can be said for PCs and tablets. If there is a winner in all this doom and gloom it's consumers all over the world. Just a couple of years ago, smartphones for below $100 where bordering on unusable. That's no longer the case. At the same time, mid-range devices are becoming increasingly competent and high-end phones are reaching new engineering heights, even though improvements over previous generations are smaller than they used to be. But nothing lasts forever; if vendors start going of out business competition will decrease and that's never a good thing.